ARLINGTON, Texas –Team Mexico coach Gerardo Venegas believes his team’s future may be in good hands with Francisco Garcia Torres. The 21-year-old posted the highest qualified ride of any Mexican rider this weekend at the WinStar World Casino & Resort Global Cup, presented by Monster Energy, when he covered Uncle G for 86.75 points Sunday afternoon. Torres joined Alvaro Alvarez (85.75 points on Harold’s Genuine Risk), Jorge Valdiviezo (84.75 points on Throw Down) and Juan Carlos Contreras (80.5 points on Pneu Dart’s Ninja Kicks) to lead Team Mexico to a fifth-place finish (4-for-18). “I feel a lot more relaxed and I have more confident in myself now that I have been doing this here on the big stage,” Torres said with the help of Francisco Morales translating. It is the first time in three Global Cup competitions that Mexico did not finish in last place. Torres got his first taste of the PBR’s rankest caliber of bulls when he qualified for the 2018 PBR World Finals last season as the International Wild Card winner at the 2018 Velocity Tour Finals. The 2018 PBR Mexico champion went 0-for-5 in Las Vegas, but he called the experience life-changing. Getting a taste of the World Finals has given him that much more of a drive for this season. Contreras nearly rode Shownuff in the Bonus Round before being ruled to have slapped the bull at 1.55 seconds. The 29-year-old qualified for the World Finals last year as a Velocity Tour wild card winner and is currently ranked 37th in the world standings. This weekend was Contreras’ first event back since sustaining a concussion in Sacramento when he won Round 2 with 88.75 points on Acting Crazy. 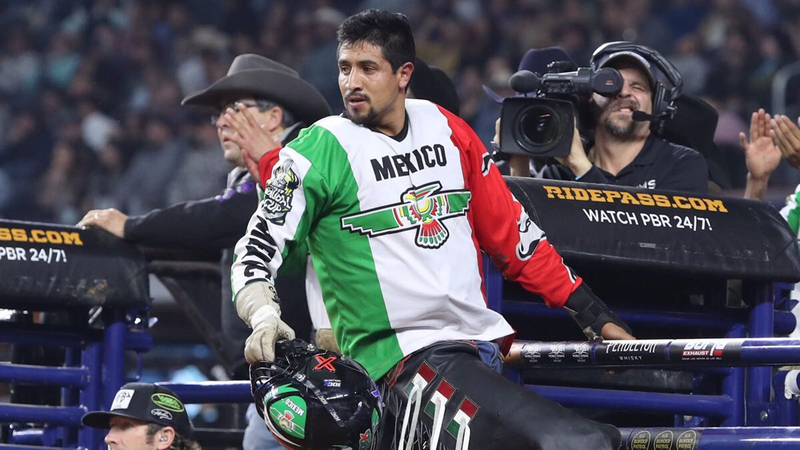 Contreras’ experience on the premier series is why Venegas believed Contreras was his veteran leader with PBR Mexico champion Morales and Valdiviezo, who was unable to compete Sunday because of a right ankle injury. “Juan Carlos is on the cup and he made a really good ride a couple of weeks ago,” Venegas said. “Him and Jorge, not taking any credit from the other guys, but I think they are the ones with the most experience at this level. Francisco Morales is an older guy, and he has been around for a while. The two-time PBR Mexico champion was a little surprised that Venegas labeled him as a leader. “I don’t feel like the leader, but I sure feel that it’s great to be helpful to everybody,” Contreras said. “I can prove just to myself, and prove to the rest of the team, that we’re not underdogs.